Miami Trace junior Shay McDonald drives to the basket while guarded by (l-r); Washington senior Kassidy Hines, junior Rayana Burns and senior Hannah Haithcock during a Frontier Athletic Conference rivalry game at the new Miami Trace High School Saturday, Feb. 9, 2019. Washington senior Tabby Woods (20) puts up a shot against Miami Trace in the first girls’ rivalry game in the new Miami Trace High School Saturday, Feb. 9, 2019. Also pictured are seniors Hannah Haithcock of Washington and Olivia Wolffe of Miami Trace. 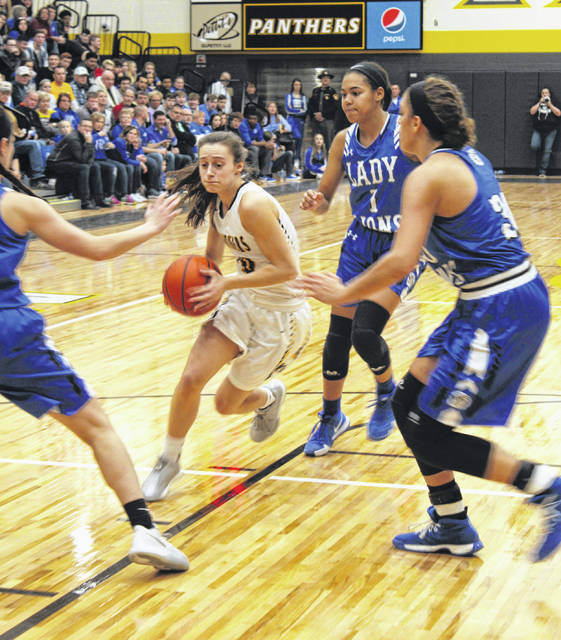 Miami Trace sophomore Gracee Stewart drives around Washington junior Shawna Conger during the Fayette County rivalry game at the new Miami Trace High School Saturday, Feb. 9, 2019. 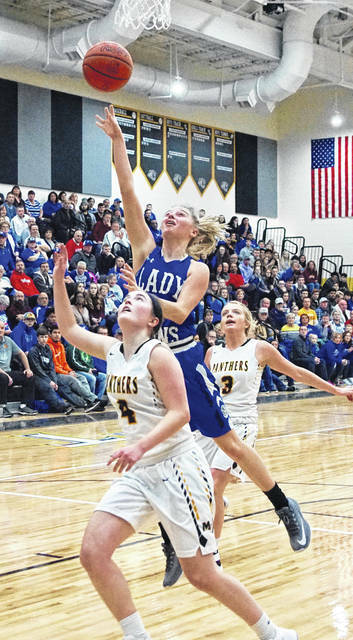 Washington High School senior Bre Taylor releases a shot over Miami Trace senior Becca Ratliff in front of a packed house at the new Miami Trace High School Saturday, Feb. 9, 2019. Also pictured is Miami Trace senior Cassidy Lovett. Washington junior Halli Wall fights to keep possession of the ball while surrounded by three Miami Trace defenders during the rivalry game at the new MTHS Saturday, Feb. 9, 2019. 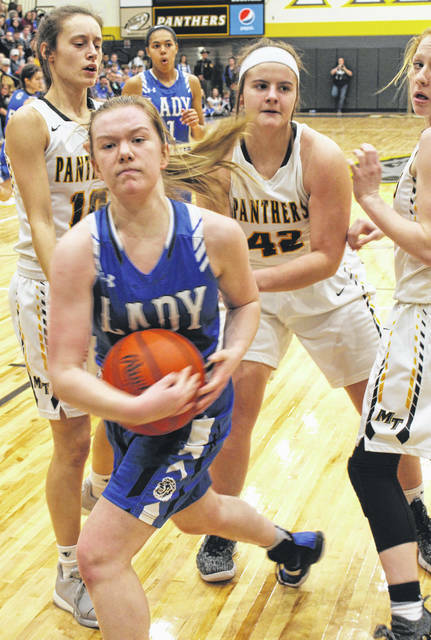 Pictured for the Lady Panthers are (l-r); junior Shay McDonald and sophomores Delaney Eakins and Magarah Bloom. Also pictured is Washington junior Rayana Burns. 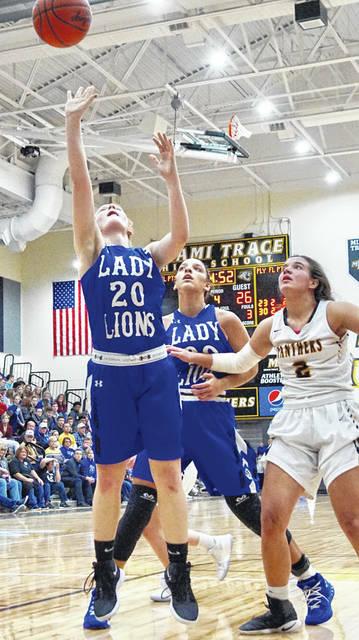 The Washington Lady Blue Lions were looking to seal the outright Frontier Athletic Conference championship before a packed house at the new Miami Trace High School Saturday night, Feb. 9. Washington came into the game with a conference record of 8-0. Miami Trace had a record of 7-2 in the FAC. Washington had to put their conference-clinching hopes on hold for 48 hours as Miami Trace played one of their best games of the season, posting a 35-33 victory. Washington indeed did secure the outright championship in the FAC with a 50-32 win over McClain Monday night. Each team must certainly have been trying to hold down the other’s leading scorer Saturday. Miami Trace junior Shay McDonald led the game with 17 points. McDonald was also the game leader in rebounds with 12. Washington senior Hannah Haithcock had 13 points, 10 rebounds (another double-double), three assists and three blocked shots. Miami Trace senior Cassidy Lovett scored eight points and senior Olivia Wolffe had three points, eight rebounds and three steals. Washington senior Tabby Woods scored seven points and senior Bre Taylor had six points, seven rebounds and three steals. Rayana Burns had five rebounds and five assists. Miami Trace led 4-0 with two buckets from McDonald. After an initial score by Haithcock, Lovett sank a free throw and McDonald scored again to make it 7-2, Lady Panthers. Miami Trace held a 9-3 lead at the end of the first quarter. After pulling to within three points at 9-6, Miami Trace went on a 7-2 run to increase their lead to 16-8. A basket by Washington senior Maddy Jenkins and two free throws from Wolffe put the Miami Trace lead at 18-13 at the half. Washington was able to draw to within three points twice in the third quarter. The Lady Panthers led by as many as nine points (27-18) with 2:46 to play in the third. After back-to-back scores by Taylor and a free throw by Miami Trace’s Gracee Stewart, the Lady Panthers led 28-22 after three quarters of action. McDonald and Woods traded scores in the early going of the fourth quarter. Trailing by four points, Washington missed a pair of free throws. Another minute or more of playing time went by before Haithcock scored to make it 33-30 with 2:10 remaining. McDonald hit still another key basket and Haithcock made one free throw with 1:25 to play to set the score at 35-31. After a couple of Miami Trace turnovers and a missed shot by Washington, junior Shawna Conger sank two free throws with 46.3 seconds to play to pull the Lady Lions to within two points, 35-33. After a timeout, Washington fouled and Miami Trace missed the front end of a one and one. The Lady Lions had another shot to tie the game, but it was no good. Washington fouled with 9.6 seconds and again Miami Trace missed the first of a one and bonus. The Lady Lions had the ball and called for time with 3.2 seconds to play. Washington got a shot away, but it was no good, ending the contest 35-33 in favor of the Lady Panthers. “This environment was second to absolutely none,” Miami Trace head coach Ben Ackley said. “I had two coaches text me who were here scouting the game, one of Sheridan and one from Meigs and the first thing they said was, wow, what an enviornment. “Coaches travel all around this time of year and they see a little bit of everything, everywhere,” Ackley said. “We know the people of Fayette County love their high school sports and their high school basketball. We’re very grateful for both groups (of fans), Washington Court House and Miami Trace. “This group has been in need of a signature win,” Ackley said. “We played with a very good Unioto team last week. We really stubbed our toe down the stretch. I made some mistakes and I’ve lived with that all week. They bailed me out tonight. “This is definitely a tough one,” Washington head coach Samantha Leach said. “First of all, I just want to say that the fans tonight were just outstanding. The amount of support that this community gives to the high school kids that come out and work (so hard) everyday. It was just awesome that these kids got to play in front of such a huge crowd. Both teams struggled at the foul line, with Washington making 7 of 15 for 47 percent and Miami Trace making 10 of 22 for 45 percent. Washington shot 13 of 46 from the field for 28 percent and was 0 of 7 from three-point range. 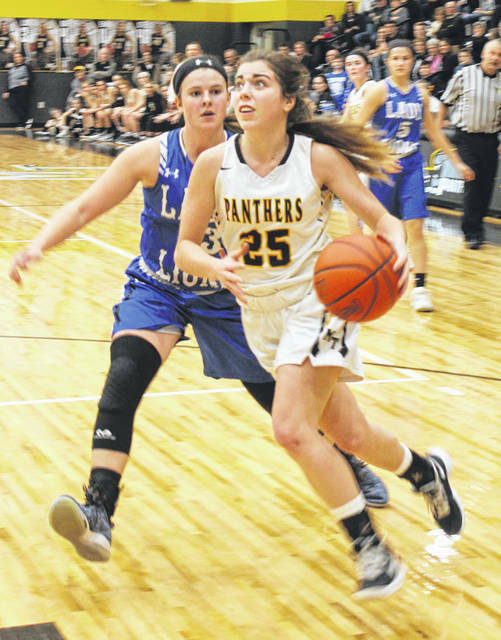 The Lady Panthers connected on 12 of 32 field goal attempts for 38 percent and went 1 of 7 from beyond the arc for 14 percent. “Tonight it just didn’t fall our way,” Leach said. “We’re going to get past it. Hats off to Miami Trace, they played hard. The crowd was great, but, we definitely have to change a few things. Hopefully this will wake us up a little bit and let us know that we still have work to do. Teams can beat us, so we have to give it our all every night. Washington will play for a Sectional championship at Adena High School against Waverly Thursday at 6:15 p.m.
Miami Trace will play for a Sectional championship at Adena High School Saturday against McClain at 2:45 p.m.
Tickets for the girls Sectional basketball game on Saturday, Feb. 16 at Adena High School will be on sale in the Main Office of the Old High School from 9 a.m. until 2 p.m. today through Friday of this week. All tickets are $5. The girls play McClain at 2:45 p.m. at Adena H.S. Tickets for the boys Sectional basketball game on Tuesday, Feb. 19 at Ross Southeastern High School will be on sale in the Main Office of the Old High School from 9 a.m. until 2 p.m. today through Friday of this week and Tuesday, Feb. 19 from 9 a.m. until 2 p.m. in the Main Office of the new high school. All tickets are $5. The boys play Hillsboro at 6:15 p.m. at Ross Southeastern H.S. MIAMI TRACE — Olivia Wolffe 0-3-3; Cassidy Lovett 1 (1)-3-8; Becca Ratliff 1-0-2; Aubrey McCoy 0-0-0; Shay McDonald 8-1-17; Magarah Bloom 0-2-2; Gracee Stewart 1-1-3; Delaney Eakins 0-0-0. TOTALS — 11 (1)-10-35. Free throw shooting: 10 of 22 for 45 percent. Three-point field goal: Lovett. Field goal shooting: 12 of 32 for 38 percent. Three-point field goal shooting: 1 of 7 for 14 percent. Turnovers: 14. Rebounds: 28 (3 offensive). Assists: 3. Steals: 7. WASHINGTON — Rayana Burns 0-1-1; Bre Taylor 3-0-6; Kassidy Hines 0-0-0; Tabby Woods 3-1-7; Halli Wall 0-0-0; Shawna Conger 1-2-4; Maddy Jenkins 1-0-2; Hannah Haithcock 5-3-13. TOTALS — 13-7-33. Free throw shooting: 7 of 15 for 47 percent. Three-point field goals: none. Field goal shooting: 13 of 46 for 28 percent. Three-point field goal shooting: 0 of 7. Rebounds: 29 (13 offensive). Turnovers: 7.